We have finally arrived in the City where our destination is. I'm glad to be here after hours of travel for the said appointment. Subsequently, since we're here trying to do some sight seeing for a change. And here we go. Been to NY but not in Buffalo yet. Maybe next time. I like the outline of the pointed building against the sky. :) By the way, Thanks for visiting my page. glad to see you are back. looks like two church steeples in the background...hope your visit is nice. Beautiful sky above the city. 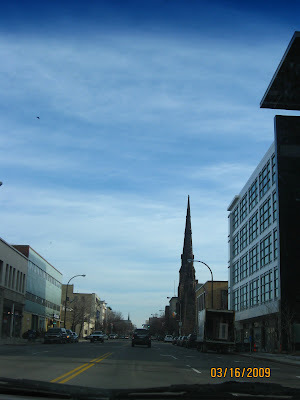 I like the steeple, and the bird in the sky, too. Hope to be here soonest.